Every day people come to Google News for a trusted view of the world. It’s there for everything from moments of political change to gripping sports events to daily local news. To make news more accessible and easier to navigate, we redesigned the desktop website with a renewed focus on facts, diverse perspectives, and more control for users. The new UI has a clean and uncluttered look, designed for comfortable reading and browsing. We’ve adopted a card format that makes it easier to browse, scan and identify related articles about a story. 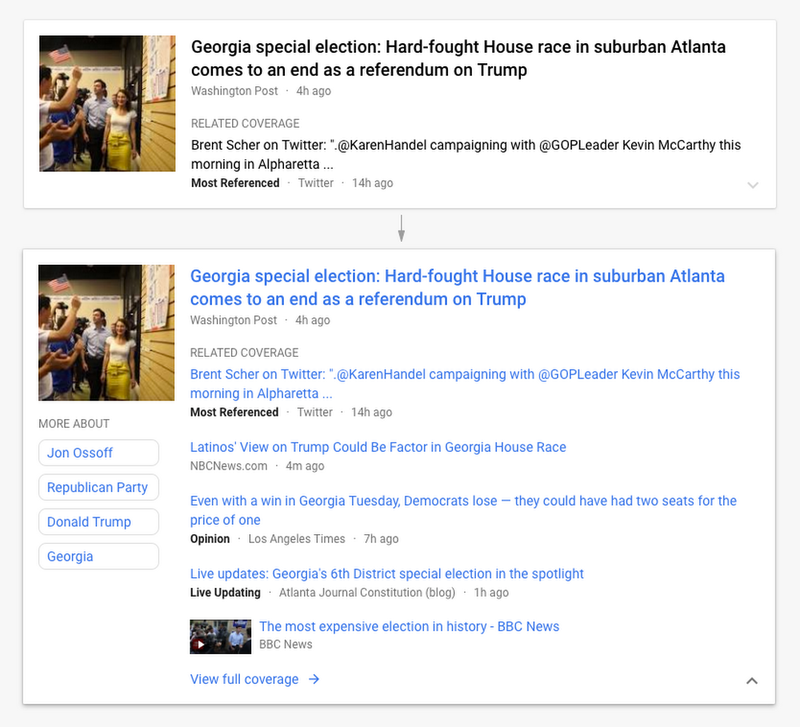 The new layout focuses on key elements, such as publisher names and article labels, and maintains your view and place on the page as you click in and out of stories and explore topics. Story cards help you explore different perspectives to gain a well-rounded understanding of an issue. The first view offers a quick glance into a story. From there you can go deeper and read articles with different points of view which are frequently labeled with helpful tags (e.g., Local Source, Most Referenced, Opinion, or Fact Check). People have told us these labels identify important facets of a story and provide more context. As a result, whenever possible, we now show a second labeled article in addition to the top headline for each story. This way you can see additional context on stories immediately even as you are scanning. 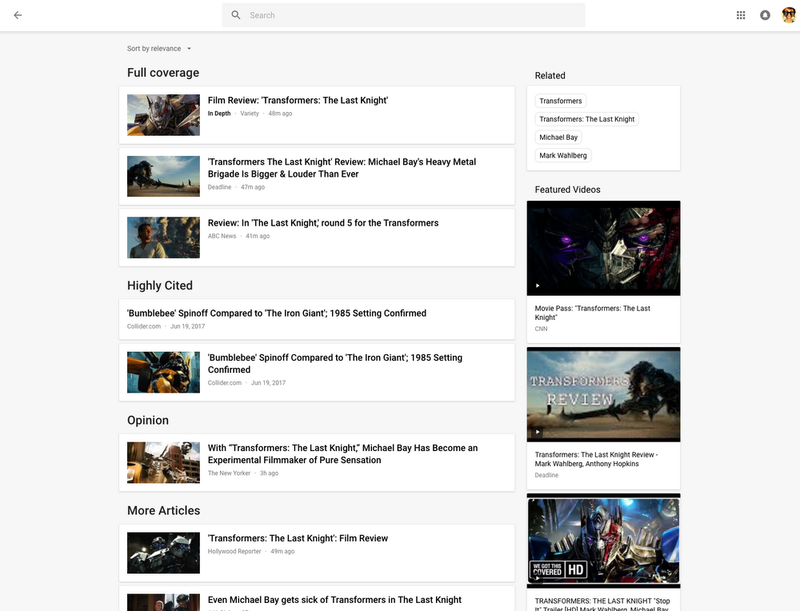 The“Full Coverage” page, as the name suggests, lets you immerse yourself in coverage about a story or issue that you want to deep dive into. Accessed from the story card, this page gives you a range of articles with a diversity of perspectives. You can sort by relevance or date, see top videos, and browse top news topics in the “Related” block. Facts are at the heart of a story’s credibility. Last year we introduced the Fact Check label so you can get easy access to fact checking articles that investigate claims made in the story. 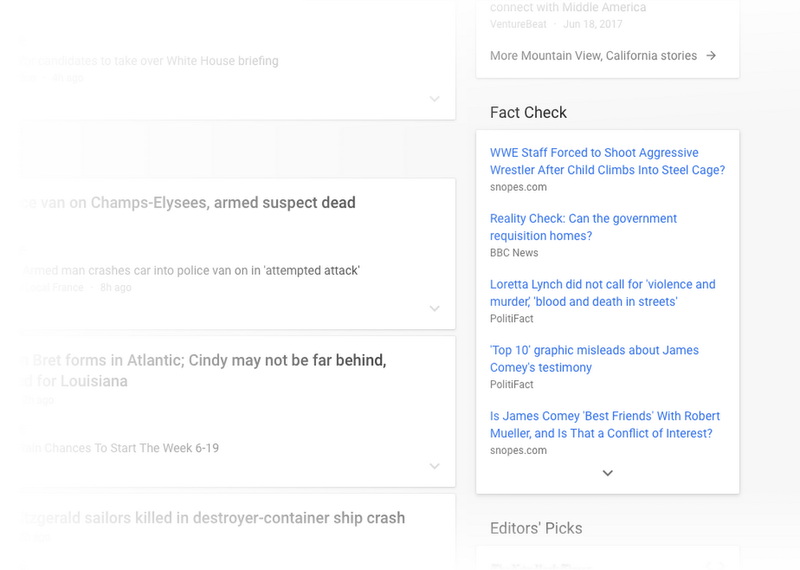 Now we’re adding a Fact Check block on the right column of “Headlines” that shows the top fact checked articles recently published (this feature is currently available in the U.S. only). Videos have become central to news storytelling, so we improved the algorithmic selection for top videos, highlighted the top video in a story card, and built a better player. While playing a video, more related videos will be available in the player. Finally, we know you want to be in control of your news, so we are making it easier to update things under the hood, with all settings in one place. 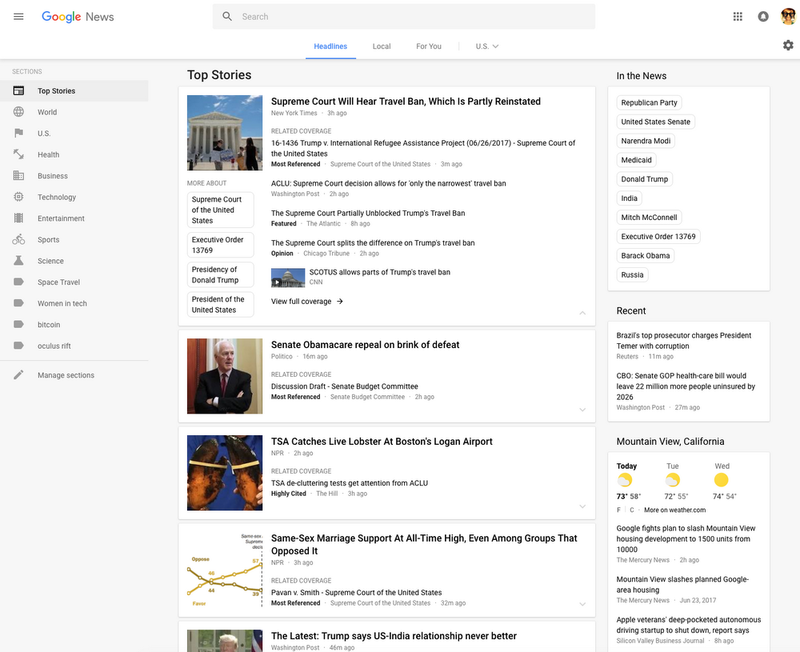 And to make Google News personal, new capabilities allow you to name your custom sections, edit existing sections, type in interests you want to see in the “For You” stream, and identify news sources that you want to see more (or less) of. We’re rolling out this update globally in the coming days. We hope the new design enables you to easily access quality journalism, bolstered with meaningful insights and comprehensive coverage.